Here we have our picture gallery of "Little Stars" playing their Schoenhut toy pianos. WANT TO HEAR SOME BOOGIE WOOGIE? Our list of Schoenhut toy pianos includes My First Piano,(currently out of stock) My First Piano 11 and the Mini Grand(currently out of stock) for the little ones. Chrildren 3 years and up will enjoy the Fancy Baby Grand or the Concert Grand (currently out of stock) with opening top. 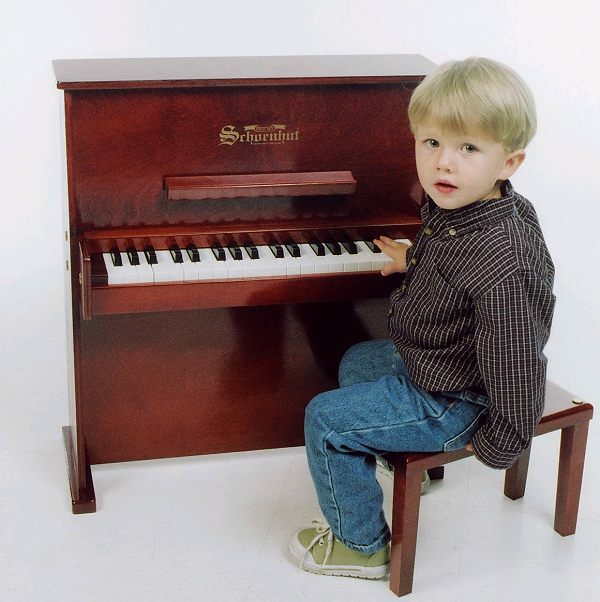 Schoenhut is one of the oldest makers of high quality toy pianos. Why not delight your child with one today! They make wonderful gifts for birthdays, Christmas, or a special present for a special kid! Also view the Elite Spinet and the Traditional Spinet toypiano. It's no wonder that many of these cute little toy pianos are constantly sold out! Started in 1872 by Albert Schoenhut,a German emigrant, these interesting toy instruments have fascinated small children for more than one hundred thirty years. Their sound is made by tiny hammers that strike metalic bars producing a chime type tone. Real pianos use steel wire that is pulled very tight, and must be tuned regularly. These toy pianos do not need to be tuned. Their sound of course is quite unique, and not at all like a regular piano. The keys of these toys are around the same width as their larger counterparts. This will help your childs finger development from the very start, making it easy for them to switch to a full size piano. Also a Schoenhut toy is not very expensive, making it a very good way to introduce your little one to the joys of making music, which also helps with their development of creativity and motor skills. Your Schoenhut should last a very long time. As a matter of fact some vintage Schoenhuts have been displayed in museums and antique galleries. The Strong Museum, located in Rochester,New York displays Schoenhut's fascinating heritage. As you can see this is one great toy piano. SCHOENHUT. A leading name in toy instruments. "Wish I could play the piano. Bet I could play some really wild Meow-sic! But my toes are too short, even for a Schoenhut toy piano, which has keys that are as wide as a real piano. Although, I maybe could play two notes at a time, if each of my big fat paws don't hit more than one key at a time. Oh well, if that doesn't work, then I'll walk on the keys like all those other crazy cats. Yeah! How about some Kool cat jazz piano music?"